When you click one of the following items on the RFQ interface, a dialog box containing up to two tabs opens: a “Generate Quote” button (if the premodifying is applicable), market name, limit value, deductible value, or premium. 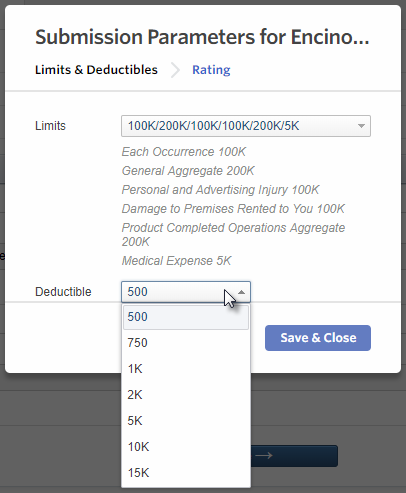 The Limits & Deductibles tab is used to change “Limits” and “Ded.” values (see the following figure) while the Rating tab, to manage the premium calculation data. Either tab can be hidden if the respective information is irrelevant: limits are not imposed, insurance costs does not include deductibles, or a carrier does not support interactive premium calculation.